In January 2018, the University of Redlands School of Continuing Studies will offer a Full-Stack Web Development Boot Camp in partnership with Cultivating Coders. The 12-week course, which will meet three evenings a week, is built upon an immersive project-based curriculum geared towards working professionals. 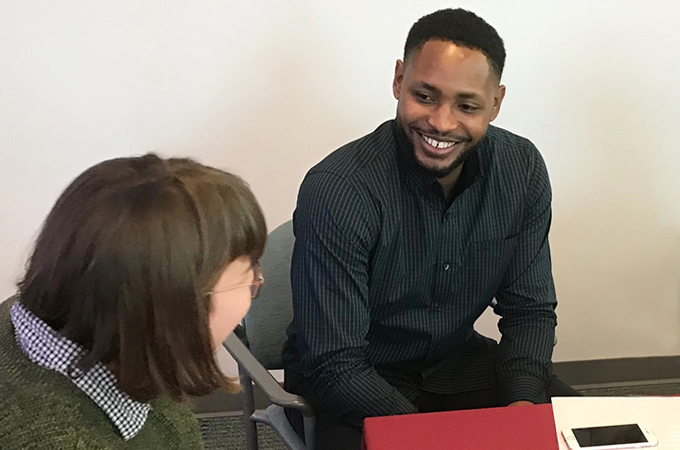 Charles Ashley III, founder and president of Cultivating Coders, chatted with Mika Elizabeth Ono and Katie Olson of U of R’s Bulldog Blog about how the program will give students the skills to apply for jobs in the technology industry. Bulldog Blog: Can you describe your mission? Charles Ashley III: We started Cultivating Coders three years ago with the mission of providing a robust and engaging experience to people who live in overlooked communities when it comes to computer science and technology. We want to eliminate as many barriers as possible. We eliminate the transportation barrier by sending our employees to live in these communities for eight to 12 weeks at a time. We eliminate the barrier of cost with funding partners who sponsor each camp. We want to work towards eliminating the gap that exists in the technology industry. It should be a human right to know how to code when the rest of the world is requiring kids to learn code in elementary school. BB: How did you begin to see the need for this program? CA: We discovered the need in places like Navajo Nation, like Clarksdale, Mississippi, in parts of Southern California. The United States is mostly made of people who don’t have access to opportunity. There are rural communities where basic necessities like broadband internet don’t exist or are ridiculously expensive. Our goal is to provide access to a skill set that will soon become an occupational requirement. BB: How did you get involved in computer science? CA: I was a poor kid from the south side of Chicago and there was a teacher who took an interest in me who really helped me improve my math skills. With her help, I graduated and went to college. I’ve always believed in paying it forward. I’m not married to computer science. I’m married to any opportunity that gives someone access and helps change their life. BB: How do you combat the learning curve that exists across developer platforms and programs? BB: Can you describe the experience that students will have upon enrolling in the coding boot camp through the School of Continuing Studies? CA: We structured the course for students who have no coding knowledge. A person only needs to be committed to the course in order to succeed. It is a very intense and robust project-based 12-week camp where students will learn about all aspects of being a developer. Students will learn how to read and execute contracts and how to work in a team environment as well as an individual. We try to prepare our students for every possible scenario that exists in the professional realm. Upon graduating, students will have the skills to apply for web developer, software developer, junior mobile app developer positions. Code is relevant in every aspect of life, and being able to code is a skill that’s transferable across all platforms and industries. To learn more about the program at the U of R, see the School of Continuing Studies Coding Boot Camp class webpage. If you have questions or are ready to enroll, please contact Bridgett Gloudeman at (909) 748-8868. A payment plans is available. To follow the course offerings at the School of Continuing Studies, follow the school’s new Facebook page.